Some computers continue computing average speed and trip time when stopping while others suspend. This means that average speeds are usually not comparable, at least in town. Some computers retain total distance, wallclock time, and wheel diameters when exchanging batteries while others don't. Mechanical stability and battery life is also an issue. A backlight is wonderful when trying to read the display at the end of the day in a campground. Cadence helps developing a proper pedaling speed. 100 rpm is much less tiring than the 70 rpm beginners prefer, and easier on the knees too. 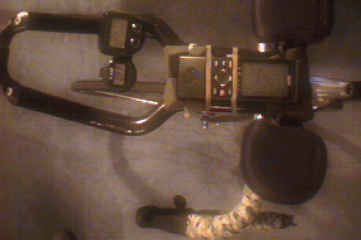 After developing the proper cadence the feature becomes useless and adds an extra wire. Wireless computers don't need a cable running down the fork but require a clunky sensor with its own battery. They also solve the problem of failing when the socket gets wet and short-circuits the connectors. Altitude is important when riding in the mountains or hilly terrain but it seems the technology is still immature, see below. I no longer use it; instead I now ride with a Garmin Legend GPS receiver strapped to my handlebars. Some computers support multiple wheel diameters, useful if the same computer is used on a road bike and a mountainbike. Does it use a reed sensor or a sensor ring? Reed sensors work with a small magnet clamped to a spoke. They are more sensitive to vibration and can drain the battery when the bike happens to be parked with the magnet next to the sensor. Sensor rings are more precise but require a longer cable all the way down the fork. Here are my experiences with three high-end computers I tried, the Avocet 50, the Cateye CC-AT 100, and the VDO MC 1.0+. The Avocet 50 has been replaced with the 55 but I haven't seen one yet. All computers support altitude using a barometric pressure sensor. works well when measuring altitude. It ignores small climbs under 10 meters, which makes it very precise. In the Alps and other mountains I have ridden in the displayed altitude matches the posted altitudes, and after returning to the starting point shows the original altitude to within a few meters. It seems unaffected by temperature and weather changes. Unfortunately it eats batteries. It needs a new pair every six months, and loses all data when replacing batteries. After the batteries are about half-empty, altitude measurement becomes extremely erratic, once I climbed 200 meters while the bike was leaning against a wall. The casing is very brittle, when dropped it can come apart and scatter components everywhere, especially the batteries (they included two spare lids). And this is for the late production model, not one of the first which were completely unusable. I had mine exchanged four times on warranty. The software is excellent, however. Every function can be reset separately. The combination of features on the display is dubious (why not current speed + trip distance in the same mode?) and it ignores button presses in quick succession, but basically it's well-designed. It has no temperature and no backlight. There is a cadence option. It's ugly and clunky, and the altitude measurement is broken. The altitude display jumps by 5..7 meter every few seconds, less often in the "fixed" newer model that also has a trip altitude function. These errors are accumulated in the total altitude gain, which makes for very impressive totals even in perfectly flat terrain. However, with a fresh battery these problems mostly disappear, then it again becomes more unreliable as the battery wears down. The user interface is stupid, one button is largely unused while the other must be pressed for two seconds to access important submodes. The combination of data on any given display is better than on the Avocet though. It is also mechanically stable, unlike the Avocet. It does stop working in heavy rain. Counts can only be reset all at once. It has temperature and backlight, but no cadence option. Like the Avocet it doesn't support 24-hour wallclock mode. This is my newest computer, and it beats the other two hands down. Finally, a reliable altimeter, and it has all sorts of extras like inclination, top and average altitude, average climb, temperature, two bikes, and so on. It also shows lots of data on the screen, and has three buttons to cycle through the alternative fields - one for the usual distance and max/average speed mode, one for odometers and clock, and one for the altimeter modes; 16 modes total. It's very easy to use. It's also wireless. That's great because rain can't stop it, but it's sensitive to stray EM fields. Recently it counted two kilometers while in my pocket in a computer store, and four kilometers in a subway near where I suppose the brakes are. Another minor disadvantage is that you need to press a button to get it out of sleep mode. This is not a bicycle computer, it's a watch. Actually it looks like a crashed flying saucer. I bought it to see if there is a reliable way to get altitude readings on a tour. It's a failure. It shows both barometric pressure and altitude, numerically and in a little graph. Pressure readings work fine in a shop window but when you actually wear it the graph dissolves into a cloud of disconnected pixels. The altitude graph is sort of fun to watch, but serious measurement errors throw off the autoranging. Its long-term history may have some anecdotal value. It has a terrible user interface and forgets the graph when switching modes. It also shows the temperature average between your wrist and the back side of the moon. Or something. Don't buy this. It's an expensive useless toy for kids and has no real value. Lovely, solves the problem, although at a high price. See below. The first three computers need to have their wheel diameter set precisely so they know the distance that corresponds to one wheel revolution. To measure this distance, make sure your front wheel is installed with the correct tire, and pump it up to the desired pressure. Mark a spot on the wheel with chalk and align it with a mark on the floor. Sit on the bike and ride forward in a straight line for one full wheel revolution, and mark the spot on the floor under the chalk mark. Measure the distance between the two marks on the floor to the closest millimeter, and enter it into the computer. Some computers require some calculation instead of accepting the distance directly. Garmin now has a GPS bicycle computer named the Edge 205. I haven't used it because although it could be the first of an exciting new species of bicycle computers, it doesn't seem mature. It's bulky, expensive, and lacks the most important feature of a GPS receiver, mapping. It may have some uses in training for athletes. 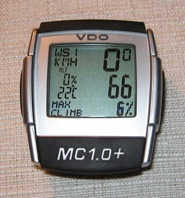 Regular computers measure bicycle statistics; heart rate monitors measure your pulse. While this seems like a very marginal option, strictly for professional athletes, it actually tells more than the current speed of the bicycle. I am familiar with the heart rate monitor made by Polar. It consists of a chest belt and a display unit that can be installed on the handlebars or worn at the wrist. The connection is wireless. The heart rate is surprisingly variable. It can jump up and down rapidly as exertion changes. It can jump from 90 to 180 or vice versa in much less than a minute - and it takes longer after a long ride. Watching the heart rate allows the rider to keep his pulse in a safe zone and avoid extremes. For example, I avoid exceeding 160 beats per minute in flat terrain because I wouldn't be able to keep it up for an entire ride, while exceeding 190 is not unusual for short bursts of speed. Just rolling along at 120 or 130 is relaxing. On a long tour I start with heart rates around 150, and after a week I barely exceed 110 even uphill. I monitor my heart rate much more closely now than my speed because it lets me plan my rides better. Of course I am talking about 100+ km rides. There is not much point in wearing a heart rate monitor when riding to the grocery store around the corner. But I do recommend them to long-distance riders. On a recent 300km ride on a single day I adjusted my speed to my heart rate, starting with 120 bpm. I had to revise this later until my target rate was 150 bpm near the end of the ride. I have done long rides before but never felt so confident that I could finish the ride safely. I recently (5/2000) got a new Polar M52 heart rate monitor that also derives fitness information, calory measurements, and training schedules from heart beat variability. It is a wonderful toy. I can't verify the calory estimates but they seem plausible. The fitness test seems dubious though - I have improved from 52 to 57 within two weeks of moderately hard riding, much faster than the manual claims is possible, with an intervening result of 44. (The numbers must be looked up in a table.) A friend got 72, way off the scale. It has two annoying flaws, in addition to a chaotic user interface: training cannot be stopped and resumed for a pause because stop mode quickly times out and aborts the measurement, and although the belt-to-computer signals are encoded the code lock is inevitably lost and is pretty much impossible to reacquire, which makes the computer pick up signals from other people. Occasionally the heart rate display is wildly inaccurate for short times. When the chest belt battery is near the end of its life, you get absurd readings like 220 beats (my heart never goes much above 200 even in absolutely extreme situations). You can exchange the battery in the display unit, but the chest belt must be sent in; it's sealed. 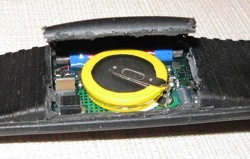 It's not very practical to cut open the belt to replace the battery; the battery is soldered to the board and the belt is difficult to re-seal (see picture to the right). Polar now offers a belt with a replaceable battery. I have recently (August 2007) replaced my Garmnin etrex Legend GPS receiver with a Garmin etrex Vista HCx. GPS means Global Positioning System, a network of 24 satellites that broadcast signals that permit computing the position of the receiver to within 100 meters in theory and between 5 and 10 meters in practice. The H in HCx is critical: it means that the device has the newer SirfStar chipset, which is much faster finding a fix, and finds a fix even in difficult situations where the non-H version gives up after half an hour. Don't buy the old model, it's very frustrating in comparison to the HCx! GPS receivers got a lot better. With my old Garmin 38 I spent half the time fantasizing that a piece of paper with the words "Poor GPS coverage" written on it would make a very cost-effective replacement for the receiver - lightweight, no batteries, with most of the functionality. The Garmin Vista HCx is the current generation which is far more reliable. After turning the receiver on, it finds an initial fix in less than a minute, and then it's quite good at staying syncronized. Trees, buildings, and other obstacles don't block satellite reception as easily as the older non-HCx versions. The etrex also stores maps; I have the Europe city street maps loaded in mine and I love it. Very expensive though, and installation is infuriatingly braindead. You must create an account on the Garmin web site, type in all sorts of private information (of course I typed in garbage, including a bogus email address), and numerous poorly identified serial numbers and bonus codes. And you must have Windows, if you have a Mac or Linux, like I do, you lose. Garmin GPS receivers allow keeping a track log, basically painting a line on the map for the route taken. That requires that it's turned on all day; I use about one NiMH battery charge per day. In 2002 I recorded an entire tour with 500-meter accuracy, and in 2004 a 1600-km tour with 1.5 and 0.5 km accuracy. I use the handlebar mounting bracket. Really nice. That was with an older Garmnin Legend; the Vista HCx can store tracks on a flash card and should have a much higher capacity. I didn't try it yet. Once again, mapping GPS receivers are great, but DO NOT buy one that doesn't have the SirfStar chipset! When choosing a camera, get one that does everything by itself and fits into the waist pouch. Wide-angle lenses are best. Don't bother with replaceable lenses, no matter of how you feel about point-and-shoot cameras. Make sure you have a spare battery. Do not take them to the beach if there is a risk of sand or water getting into the camera. I used to use a Nikon AF-600 with the Panorama switch glued in the off position, but today (2006) I use a digital Canon S80 and I can't believe that I ever put up with a pre-digital chemical camera. I love my Canon. Don't make postcard pictures. The pictures should help to remember the trip, not impress your friends. Prefer pictures of things of personal significance. A picture of your hotel room will prove more valuable than one of the Eiffel tower. Make sure any picture has both foreground and background. The foreground element should have an identifiable size to give a reference point - a person or bicycle will do, perhaps plus a tree or street light. There should be an element that connects foreground and background to give a sense of perspective and depth. A road or the edge of a forest work fine. There should be a focus element in the center of the picture. If there are two interesting elements make two pictures instead of combining them into one with a big void in the center. The foreground should be darker than the background to increase the depth impression. Choose a point of view when the sun is to one side, not behind or in front of you (unless you want to make an effects shot); the shadows give structure to flat surfaces. If the scene has some very bright spots, point the camera to an evenly lighted area and let it do its light measurement there. Most cameras do the measurement when the button is pushed halfway in and takes the picture when it is pushed all the way in. Otherwise the picture will be all dark and mushy except for the bright spot. If you insist on using an old-fashioned chemical camera, the lab will mercilessly overexpose dark pictures to reach an average light level. It's extremely hard to make a picture that shows the steepness of the road you are on. Don't even try to point the camera down or up to show the incline; keep the view axis horizontal. Another tip for chemical cameras: the first few pictures of a roll of film should not have bright colors or unusual brightness because the lab uses them to calibrate the development machinery. Also, the first and last picture are often lost or taped over by the lab. Quaint. The picture above is an example from my Marmolada tour. 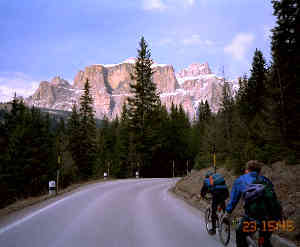 There are riders in the foreground who give a size reference, a road distorted by perspective, dark trees in the foreground with a tall one in the center, and a brightly lit mountain in the background that almost seems to float. It happens to be a downhill but one can't see that. I have replaced my old chemical camera with a digital still camera (Canon S80, replacing an older S40 and a primitive Sony). The choice between chemical and digital is not one of storage medium. The digital camera is a completely different device because it encourages taking snapshots at any opportunity. I now take at least five to ten times as many pictures because they are so wonderfully easy to take, review, delete, store, and process. No more guesswork, waiting for prints, extra expense for additional prints, and stacks of paper printouts. Bring one to a party and everybody starts posing and having fun. Digital cameras are a true revelation. Professional photographers, and aspiring amateurs, will tell you that point-and-shoot chemical cameras and digital cameras cannot take serious pictures. This may be true if you are a professional photographer but it is nonsense for people like me who want to take high-quality snapshots with little preparation and posing. I have digitized well over a thousand old chemical photos, and let me tell you, chemical photography is the pure horror. Film ages, gets scratched by the camera, the lab, and in storage, and it inevitable attracts dust that gets embedded in the emulsion. Another thing I never stopped to think about: chemical cameras cannot compute a white balance, so most pictures will have incorrect blue (sunlight) or yellow (incandescent light) tints. Take a close look at older film and you will be shocked, and amazed how the lab could possibly get decent prints out of such information garbage. Take my advice: do not use a professional, adjust-everything-manually camera if you just want to take snapshots. My Canon does have manual modes and I have beautiful night shots with them, using a tripod of course, but much of the time you'll just want to whip out the camera, take a picture, and ride on. In such a situation your pictures will be worse with manual adjustment unless you are a whole lot more meticulous and willing to spend much time to prepare each shot and adjust the camera than I am. If you must stick with chemical cameras (they are still cheaper), use a fully automatic camera with a good lens; if you want to get good pictures get a digital camera with a good and not too small lens! I am serious. You can still make mistakes with a digital camera, of course, but at least you'll see your mistake immediately, and once taken a picture never degrades or gets scratched. And, to repeat this important point, a good large lens is much more important than whether it has two or ten megapixels. Don't even think about the toy cameras built into most modern cell phones, and their megapixel claims, the lenses and CCD chips are a joke. I used to have a Sony F55E but the swivel lens killed the printed cable inside. My new Canon is far better than any Sony I have checked out. Also, I am truly tired with Sony's overpriced proprietary memory sticks, and I wanted CF cards. Half the price per byte, and available with eight times the capacity. Sony is off my list. Anything that needs xD cards too. Check out www.dpreview.com for good reviews.